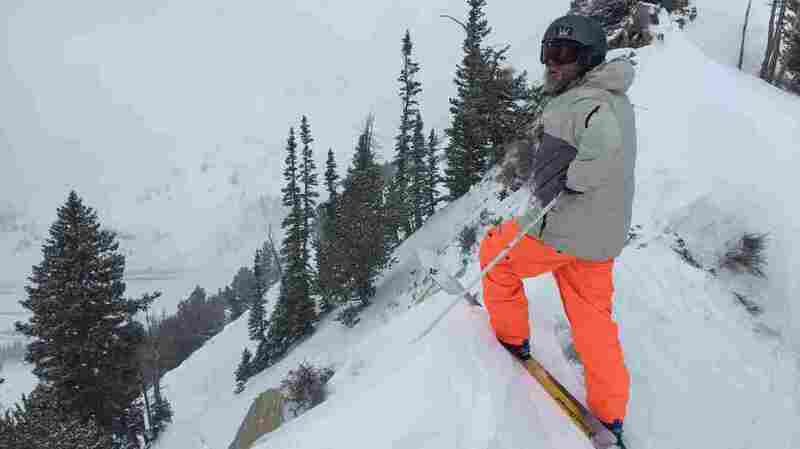 Court Upholds Snowboarding Ban At Utah Ski Resort : The Two-Way Alta Ski Area markets itself as just for skiers. It is one of the few U.S. resorts to do that. A skier gets ready to plunge down Alta Ski Area's extreme run, Eddie's High Nowhere. The resort has banned snowboarding since the sport was invented. The case touched on a sensitive topic in the ski industry and especially in the West, where most resorts depend on leasing land from the U.S. Forest Service for their operations. Does a ski area have the right to prohibit or single out a certain type of user's access to federal public land that's supposed to be open to everyone? A nonprofit organization calling itself Wasatch Equality argued it didn't. The group, which includes professional snowboarder Bjorn Leines, filed suit in 2014 alleging the ban violated the Equal Protection Clause of the U.S. Constitution. But the 10th Circuit Court of Appeals, in upholding a lower court ruling, concluded that Alta had a right to enforce its policy because the U.S. Forest Service didn't influence the decision and therefore it wasn't a blanket "state action" that could have amounted to discrimination. There's long been friction between skiers and snowboarders. And Alta, east of Salt Lake City, has prided — and marketed — itself as a snowboarder-free destination. Slogans boast this all over the mountain, including at lift ticket windows and near an entrance gate that connects Alta with the adjacent Snowbird Resort, where snowboarding is allowed. The case was closely watched because a ruling in favor of the snowboarders could have called into question the legality of the few remaining snowboarding bans at ski resorts in the U.S.
Only Alta, Deer Valley in Utah, and Vermont's Mad River Glen still ban snowboarders. Taos Ski Valley Resort in New Mexico lifted its ban several years ago.